Slice oranges, limes, and lemon into thin slices. Add to a large pitcher or jar with cranberry juice, orange juice, moonshine, tequila, and triple sec. Add frozen cranberries and enough ice to chill it well. Serve punch in punch glasses with fruit garnishes and a splash of club soda in each glass. Freeze cranberry juice into ice cubes to make sure the punch doesn’t get too diluted! This punch is powerfully perfect for fall parties! It used to be that to get a jar of moonshine (I think moonshine only comes in jars), you had to travel to some shady area of West Virginia and know a man who knows a man. It’s also possible that moonshine would cause mild blindness, so we’re all lucky that these days we can find actual good moonshine in most liquor stores. Of course, moonshine is pretty close to vodka (distilled liquor) and you could easily use vodka instead of the real stuff, especially for a punch like this. My favorite thing about this punch is the colors. It almost looks healthy! But trust me, it packs a punch so sure you have a few friends to share it with. If you can plan ahead a bit, I recommend pouring some cranberry juice in a few ice cube trays and freezing them. Not only does this look cool, but it will prevent your punch from getting watered down later. Okay. Let’s talk punch. First, you need some fruit! Slice all of this fruit up and add it to a big jar with frozen cranberries. These will also keep the punch chilled, which is nice. Not sure I would recommend actually eating them because man, are they bitter—but they look great in the punch! Then add in all that delicious booze! I like a mix of moonshine (or vodka), tequila, and triple sec. Then add in the juices and let everything chill down. Serve the punch with some fruit garnishes and a little splash of club soda for some bubbles. 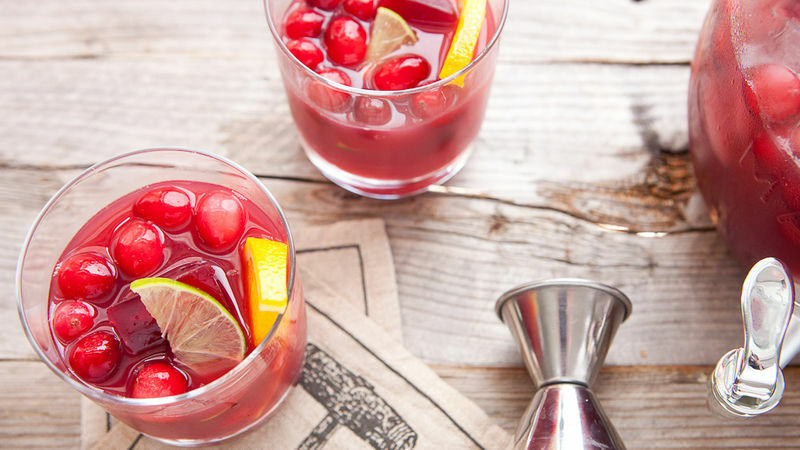 This is a great punch for a holiday party (right around the corner!) or really any fall party you’re planning. Are you a moonshine fan? Leave a comment! Nick thinks this punch will make you friends! Check out his blog, Macheesmo, and follow him on his Tablespoon profile.